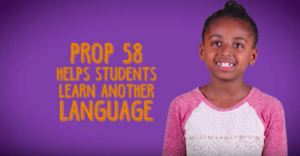 In November 2016 California voters overwhelmingly (73.5%) supported the passage of Proposition 58 (also known as California for a Global Economy Initiative, or CA Ed.G.E) to promote and encourage multilingual programs for all students. The final implementation regulations have been released. You can find them here. You can find the education code that authorizes them here. .